Larry and Bev Turner own Emu Ridge, the only commercial Eucalyptus Distillery in South Australia. Eucalyptus Oil distilling was once one of Kangaroo Islands major industries. It began in the 1880’s, and was a supplementary income for the farmers clearing their land for sheep farming. In the 1930’s it reached its peak with 48 stills employing over 600 people and over the eucalyptus distilling era there were around 100 stills on the island. One company, F.H. 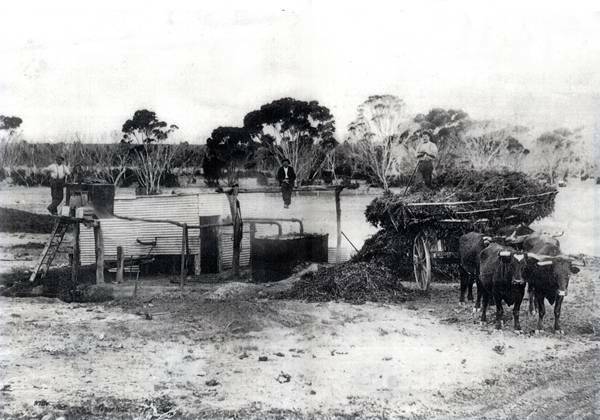 Faulding & Co purchased Emu Ridge in 1923, establishing two plantations in 1938 for the purpose of systematically harvesting it on a rotational basis. (The Narrow Leaf responds well to pruning.) Most success, however, was achieved by individuals who set up stills as a seasonal sideline. 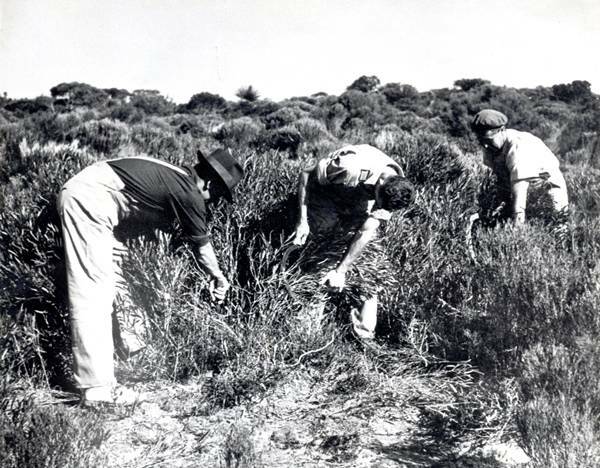 In the 50’s Sheep farming took over being more viable for farmers, a few stills continued operating after that time but nothing commercially, thus eucalyptus distilling became part of history. In 1991 the islands economy was bleak. Larry a fourth generation sheep farmer and abit of a schemer came up with a few ideas. The thick scrub his ancestors worked so hard to clear became an unlikely saviour. The history was on our property, so we discovered after we started. Our oil is the only one of its kind in the world. It is known for its pungent aroma, and is distilled from the leaf of the indigenous Kangaroo Island Narrow Leaf Mallee, Eucalyptus cneorifolia. This unique oil is the only one of its kind in the world. Starting with nothing but salvaged material and a lot of initiative the business has very humble beginnings. From an old caravan by the Eucalyptus distillery to a small craft shop in the old MacGillivray Post Office, later was the expansion into the larger retail shop built from the recycled materials from the shearing shed, which is now a plant nursery. More recently the cellar door and bar, café, gallery and decking. After being self sufficient for 20 years operating on steam, solar and wind Larry and Bev succumbed to having mains power connected for their 20th birthday. This 250 ha farm now employs 16 people in peak season. Eucalyptus oil was Australia’s first true export overseas, these days Emu Ridge is the only Eucalyptus Oil Distillery in South Australia with only a handful left in all of Australia, 90% of the worlds Eucalyptus oil comes from China and Brazil! Bev and Larry are proud to have revived a historical industry that had once thrived on the Island and preserved a major part of KI and Australia’s heritage. We provide a unique tourist destination on Kangaroo Island. Our vision is to work towards environmental sustainability, land management and re-vegetation. These ideals have created a truly rare and exceptional style of business and the positive response from our customers has further added to developing this philosophy. Hi thanks for your enquiry, it all started with the down turn in wool prices in 1991, it was just something to do in the beginning, my husband and his mate wanted some eucalyptus oil to use as a penetrine oil to fix an old tractor, then decided to get some labels made and sell it as it was always a huge industry on Kangaroo Island. Who would have thought it would have grown into what it has today.